Chennai Temples - Ghumakkar - Inspiring travel experiences. Chennai – Though a modern city, it continues to be traditional and conventional in certain ways. Traditional music, dance and all other art forms of Tamilnadu are very popular in the city. One can find a unique blend of culture from traditional foods to fast foods, from ancient temple architecture to modern high-rises and from classical music and dance to the growing nightlife in the city. So today through this post I will take all of you to the few temples of Chennai. 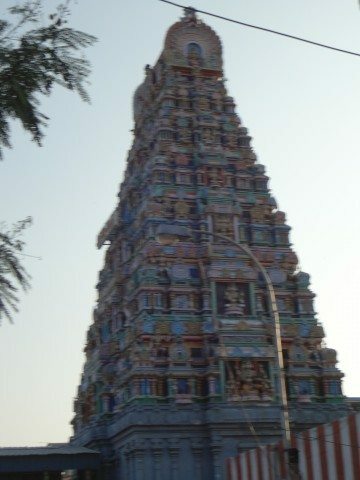 Chennai city is full of temples. Every street, every road will have one or two temples. There are many famous temples in Chennai. So, today we will see ISKCON Temple, Shirdi Sai baba temple, Marundeeshwar Temple. All these temples are on ECR, and can be clubbed easily for visiting. 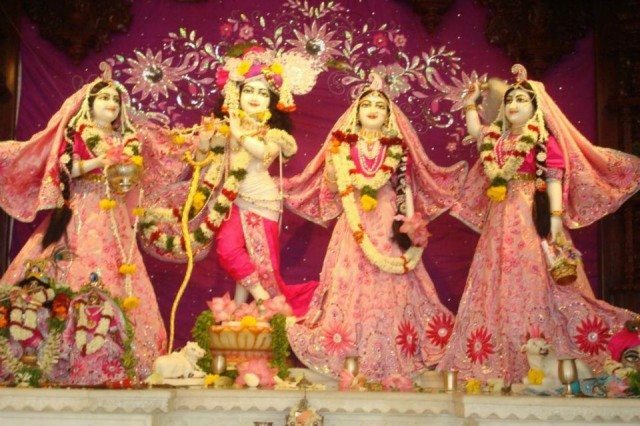 ISKCON Temple – ISKCON is famous all over the world for its Radha Krishna temples which are acclaimed for their breath-taking beauty, high standards of worship and cleanliness, and satisfying spiritual vibrations. 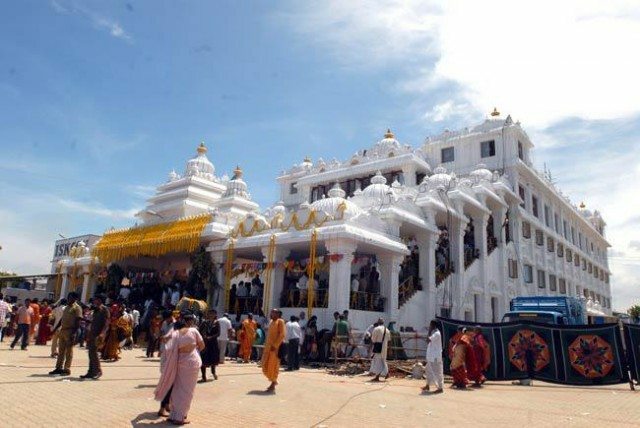 Chennai ISKCON temple was recently opened and still some part of it is under construction. 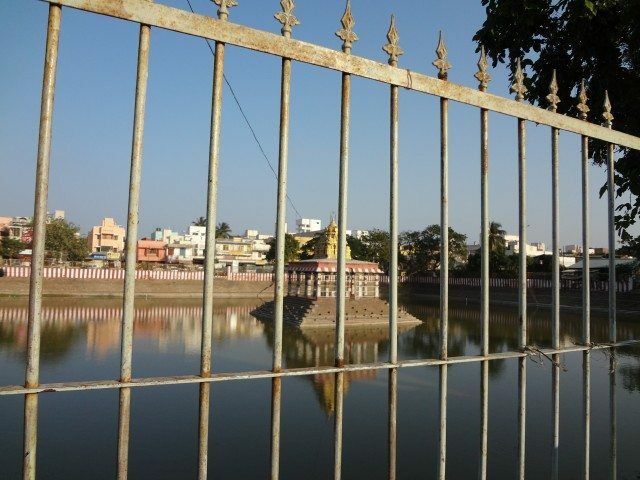 For the construction of temple 6.5 acre of land was acquired at Injambakkam, Chennai. 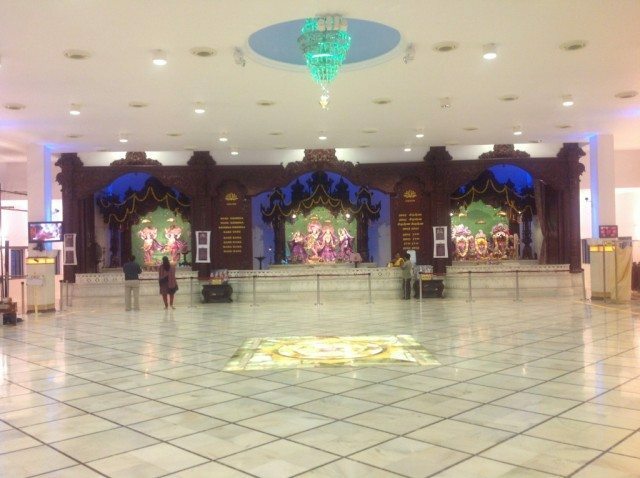 The temple has Basement, Ground floor, mezzanine floor and first floor. The ground floor houses a beautiful cultural hall, mezzanine floor will have rooms for guests and offices and on the first floor is the beautiful temple. Basement is a big prasadam hall. Temple houses beautiful deities of Lord Balbhadra, lord Jaggannath and Goddess Shubhadra, Lord Krishna with Goddess Radharani and their sakhi Lalitha and Vishakha and Lord Chaitanya & Lord Nityanand (Gaur-Nitai). Best time to visit : Sunday afternoon, so that one can enjoy the tasty Prasadam. How to reach : This temple is on ECR, Akkarai and is approximately 25 kms from Chennai railway station. If you are visiting Mahabalipuram or Pondicherry via ECR then this temple will be in your route. It is a very beautiful temple with numerous fixed glass windows permitting maximum sunlight thus saving lot of energy. All windows are nicely painted with mythological pictures. Beautiful wall painting, pillars and a huge darshan hall makes this temple very attractive. I really like the wooden doors of the enclosures where deities reside. It is a huge wooden door with beautiful carvings. Every Sunday , a special programme is held in this temple which includes bhajan, Bhagwat Gita course, Aarti and at 1315 hrs lunch Prasadam for everyone. 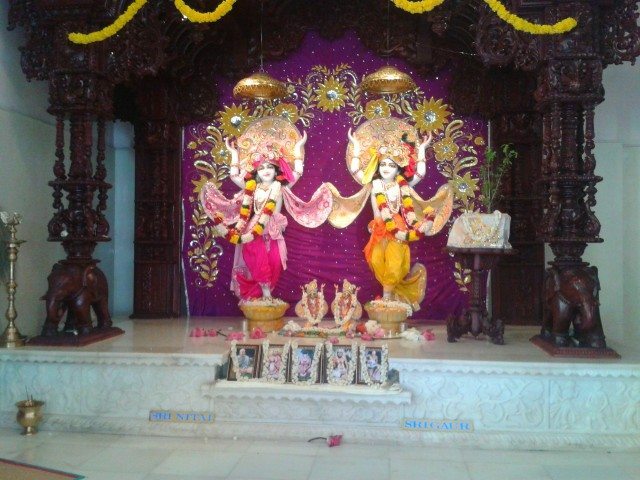 We generally visit this temple on Sunday so that we will be blessed with Krishna’s prasadam. Sambhar rice has been served as Prasadam here and I must tell ; for me this is the best Sambhar rice I ever had. The main reason for such a wonderful taste is that because it is a Prasadam and I just love this Prasad. One good thing about this temple is that there are no security checking and even photography is allowed. Next Temple is Shirdi Sai baba temple at Injambakkam. 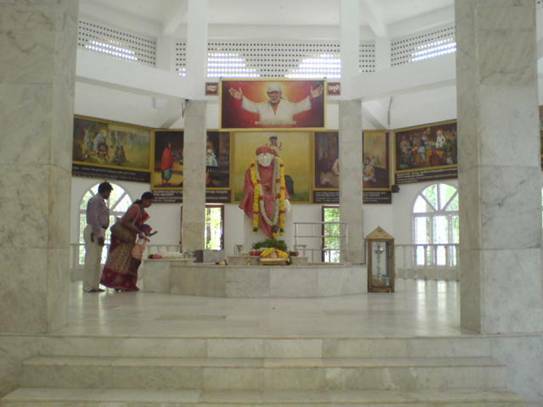 SHIRDI SAI BABA Temple: This temple is 17 years old and is situated at Injambakkam, in a lavish seven acres of land, ECR, Chennai. This temple has huge car parking area inside the temple premises. Address : Shirdi Sai baba temple, Saipuram, near food village restaurant , Injambakkam, ECR,Chennai. How to reach: This temple is also on ECR .If you are coming from Chennai then it is on your left side. After parking our car, when we moved further in this temple we come across Lord Ganesh temple and other shrines dedicated to Lord Shiva and Parvati, Durga mata ji, Hanuman ji, Sita, Ram & Lakshman ji, Balaji, Navagrahas, Radha Krishna and Murugan Bhagwaan. After taking darshan when we moved further we saw another place which is called as holy fire (Dhuni) and it says that it is also burning uninterruptedly at Saipuram. After seeing this we moved further and saw wish fulfilling tree. Devotees tie turmeric dipped string around the tree on for their wishes to get fulfilled. There are other temples like Gayatri mata temple, Jhulelal ji temple and Gaushala inside the premises. It is again very nice temple where you will find lots and lots of peace. Next temple is Marundeeswar temple. Address : Sri Marundeeswarar Temple, Tiruvanmiyur, Chennai. Phone numbers: +91 – 44 – 2441 0477. How to reach : This temple is also at ECR , 2 minutes distance from Thiruvanmiyur bus stand, Chennai. The Primary deity, The Marundeeswarar Lingam is said to be naturally formed and not sculpted by anyone. It is believe that Lord Shiva taught Sage Agasthya the medicinal qualities of herbals and the medicines for various diseases, hence is also praised as Marundeeswarar – Marundhu in Tamil means medicine and Eeaswara God – God of Medicines. In this temple devotees perform milk abishek to Lord and consume the Vibuthi (sacred ash) Prasad for cure from prolonged illness and relief from sins.. In the Mahamandapam (Main temple) where the deity resides, there are many shivalings, 70-80 god idols and the replicas of the five lingams of the five elements. The divine cow Kamadhenu is believed to deliver milk to the lingam daily and hence the lingam is white. Another name for the lingam is ‘Paalvannanathar’ (in Tamil, ‘Paal’ means milk, ‘Vanna’ means colour). And hence, Paalvannanathar means ‘one whose colour is that of milk’. As per history available Lord Marundeeswarar is known so because he taught sage Agastya about some magical medicine. Since then the Marundeeswarar temple has been a place of worship for people with diseases and various problems with their health. It is said that even The Sage Valmiki, who wrote The Ramayana , came here to The Marundeeswarar temple to worship The Lord. Sage Valmiki was said to be blessed here. After this incident, this place was to be known as Thiruvalmikiyur, after a long period of time, the name gradually changed to Thiruvanmiyur. There is a place present in Thiruvanmiyur called Valmiki Nagar in his honour. I really like this temple because of its stone work, stones pillar and 7 tier beautiful Gopuram.The presiding deity in this temple is Lord Shiva. There are small temples of Lord Vigneswara, Lord Murugana and Goddess Parvathi and Nagdevta.Unfortunately photography is not allowed inside the temple premise. It has two gates for entry. First one on the ECR and the other one is on the rear side of ECR (West Tank Street) which is actually main gate. At the entrance on the right side big tank (Kund) of this temple is located. The big tank of temple is outside the temple premise. As soon as we enter in the temple there is a big lobby. On the left side of lobby is another small tank of temple and on the right side is the stage with lord Nataraja picture painted on wall. 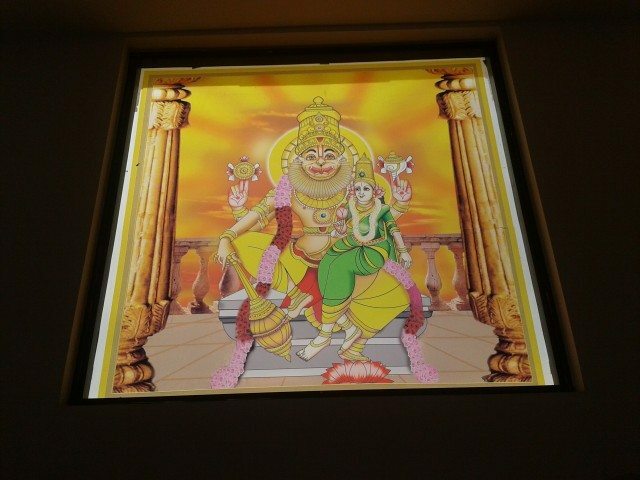 The ceiling of this lobby is beautifully painted with the pictures of Lord Murugan, Kaamdhenu cow and other god and goddess. 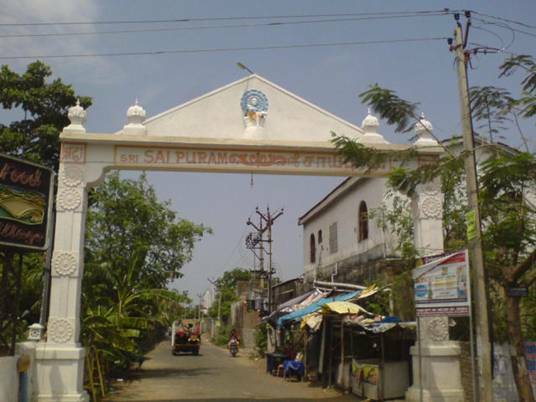 At the end of lobby is the second gate of the temple. Right opposite the second gate is Lord Ganesh and Lord Murugan temples and on right side is Goddess Parvathy temple. On the left as we walk little further Lord Shiva temple comes. First comes lord Nataraja temple and then inside the temple, Garbha grah has main shivalinga. The old style is very well maintained in this temple and only alteration done inside the temple is CFL lights. 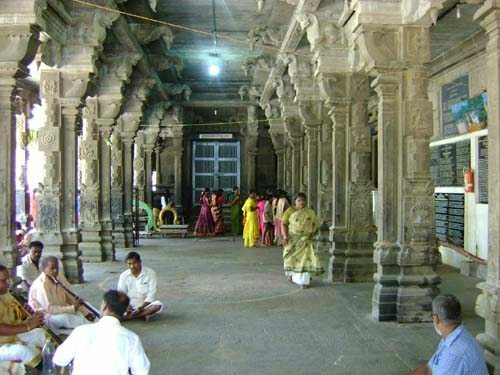 Otherwise it is same old style temple with black stone walls, pillars and ceiling. This temple covers approximately 1 acre of area. When we first visited this temple in the month of October (Dusshera festival) there were navaratri programmes of Bharatnatyam and Classical music were performed in this temple. It gave us such a good feeling that we are so close to culture. During Navaratri Golu or Kolu is (a toy festival ) celebrated in Southern India. This is an exhibition of various dolls and figurines in odd (usually 7, 9, or 11) numbered tiers. 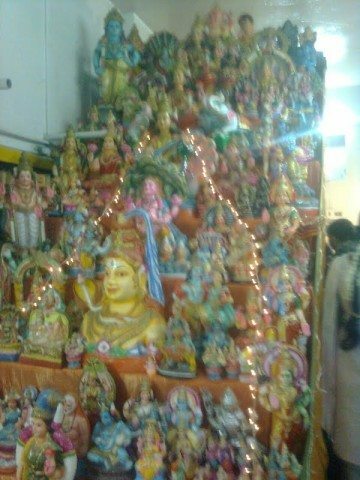 Kolu or Golu in Tamil means Divine Presence. Kolu represents the divine presence of the Goddesses Saraswati, Parvati and Laxmi in their houses during Navaratri (Nine nights). If you happened to visit this temple in evening, do not forget to buy enjoy Prasad like Pullyiodharai (Tamarind Rice) and Chakra pongal (Sweet dish made of Moong dal ,rice and Jaggery) (Rs 10/- each). So here I stop my post here. Still many more places to be discovered at Chennai. 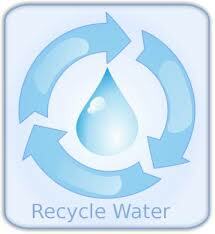 Collect water used for washing fruits and vegetables and used them for watering plants. Really nice post Abhee.. Looking forward to the next one in the series! Thanks Archana :). I Know why you have commented. All my visits to Chennai have been rushed that once I was able to ‘see’ Marina beach in pitch black night. Thanks for introducing us to the temples in Chennai – next time these are all must-see. At least Iscon temple authorities permit photos to be taken. Chennai also has some must see places but are less advertised.Hope with this series people visiting Chennai will take out some time to explore Chennai as well. Thank you SS ji for liking the post and pictures. Hope you will like the series also. A great beginning to what promises to be a lovely series, Abhee. Very informative and useful for people who are religiously inclined. I think it is a great idea to club together temples based on their location. However, it might be a good idea to expand abbreviations since not everyone might know that ECR means East Coast Road. Thanks DL sir for liking it. I mentioned about ECR in my previous post of Chennai Diaries , but forgot to mentioned in this series. but I must admit this , no explanation. I will take care of such things in my future post. Nice post Abhee, detailed & informative. Thanks Amitava for liking it. It will be especially useful for the many people who want to visit temples wherever they go. To me, the Marundheswarar temple looks the most interesting of the three in this series – but then I am always partial to heritage vis a vis modern structures! Years ago, I remember we had taken some visitors to enjoy the buffet meal at ISKCON in Mumbai. There must have been at least a hundred different varieties of pure veg satvic food including Thai, Mexican, Italian etc. At that time, it was quite a novelty to get such varied cuisine in pure veg ! PS: Everytime I press Submit, I get an Error message and this is certainly not the first time. Does this happen to others as well? Do I have to change any settings to avoid this? Marundheeswar temple is really a beautiful temple. There are few more beautiful temples of Chennai I will be introducing in my next post (Some of them are of your interest too). ISKCON temple Govinda Restaurant always gives superb vegetarian satvik food. 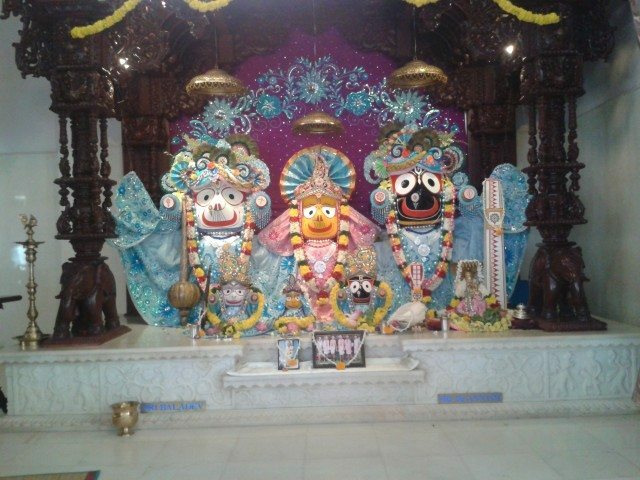 We have one more small ISKCON temple in our locality ( Check my future post on that too) . This temple serves superb Gobhi Manchurian , cakes and pastries all veg and satvik. Before submitting comment , the new verified format of arithmeticals (CAPTCHA) are coming below submit button. I faced this problem only when I didn’t notice new format else it is ok . Adding my appreciation to the list here :-). Indeed a very informative post. I am hoping that I make use of this sometime. @ Gita – Hope the problem is gone now. Thanks a lot Abhee Ji for the informative post as in near future I have no plan to go Chennai so it is really good. yahi baithe punya kama rahe hai………………………….. reading one by one the series as in past not read so giving comment late. mundakanni amman temple(no body of the deity is found, remedy for naga dosham), mylai kabaleeswara temple(this temple was destroyed by christians during their invasion, and subsequently santhome church was built on top of it), sri kaleekambal temple(chatrapati shivaji maharaj visited, remedy for marriage problems), thiruvottyur shiva temple(only once in a year the lingam will be viewable, else it will be covered by a silver dome), mylai draupadi amman temple, sri kamakshi amman temple near saveetha dental college at poonamalle high road, thiruverrkadu amman, mangadu amman, vadivudai nayagi amman temple, sri pratyangira devi temple shollinganallur, kachabeswarar temple, near thambu chetty st, sri kalleamman temple, pozhichallur, pallavaram(do not spell it as kali, it is kallee, famous for granting justice to their devotees), kundrathur murugan temple, the list is endlesss……. This birth alone is not enough, you need to be born as indian for thousand births to get the boon to visit these temples….. Thanks for such a long list of temples.Whenever I will go back to Chennai I will visit these temples and also provide this information to all future visitors. Also, I had not yet finished my Chennai series, so I can add few more posts on above temples. देखा मंदिर के पास से ही भागीरथी बह रही है. यहाँ पर भागीरथ का छोटा सा मंदिर है. हम लोग भी भागीरथी के किनारे खड़े ही कर निहार रहे थे. सुबह के 7 बाज रहे थे धूप खिली हुई थी. आस पास का वातावरण बहुत सुंदर लग रहा था . कुछ लोग इस ठंडे मौसम मे भागीरथी मे स्नान कर रहे थे. मैने पत्नी से नहाने को कहा पर उनकी तो हिम्मत नही हुई.